I've finally gotten my hands on this book. There's a Chinese edition which I saw at Basheer bookstore, but this is the English edition which I bought from Amazon. The author Haitao Su has been creating character design, cartoons and illustrations for nearly 20 years. It's a privilege to have a character design book written by him. Good character design books are rare, and this is a wonderful book. The amount of character designs featured are immense, beautiful and incredibly varied. The pages are packed with unique and expressive characters which are a joy to look at. The physical form of the characters can be felt and that really adds on to the believability. Almost all examples are drawn by Haitao Su himself. They are all accompanied by insightful commentary and really gives you lots to think about when designing your own characters. Lots of individual characters that he drew for commissions are analysed. There's even a chapter on inanimate character designs which gives tips on how you can turn static household objects alive. The book ends with interviews with five top character designers, namely Dean Yeagle, Stephen Silver, Florian Satzinger, Francisco Herrera and Ben Caldwell. There's also an interview with Haitao Su himself. This is a inspiring art book on its own, made even better with useful information that's shared. 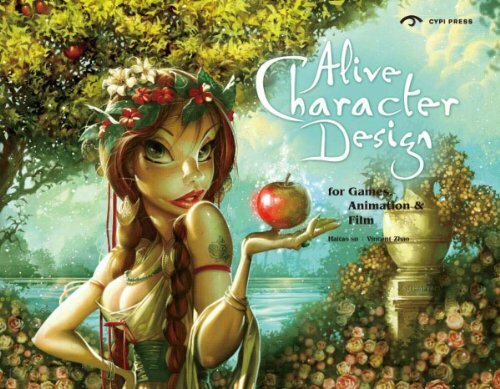 Highly recommended to character designers and art book lovers. This should be one of top 2011 art books. This is on my list. Great looking exaggerated characters. excelent work.. i want to learn charecter design.. can you teach me? I'm not a character designer. Maybe you can start with some books from this list. This book looks amazing. Too bad it's unavailable on Amazon Canada already :( Any idea if they typically refill these things? ie should I wait it out, or need to import it. Anyway, amazing blog! Lets me find out and sample books I would never have heard of, like this gem. You can just buy it from Amazon US and ship it to Canada. The shipping isn't too expensive. This book looks like one im interested in but the thing is sold out then come back on amazon uk pretty pricey! wow....this is the perfect book for me......i just purchased the art of tangled when i saw this one!!! this is a must have for me......right? i wanna be a character designer as a professional and have been working hard and truly need the inspiration....please do reply if you think its suited for me cos i really have to use my little left money wisely! This is a good book. There aren't a lot of character design books around. well i guess im gonna go with this book! cant wait to have it! !